A talented children's choir from Staten Island is moving on up from the school auditorium this year. Actress Anne Hathaway made a surprise visit to P.S. 22 on Thursday night to tell the school's chorus they would be performing at the 2011 Academy Awards in Los Angeles. "Two things. One thing I have to say is wow, you guys are incredible, that was the greatest concert," Hathaway said over the screams the excited kids at their winter recital. "That's the first thing. The second thing... I am here to officially invite you guys." The rest of her sentence was drowned in the shrieks of children. 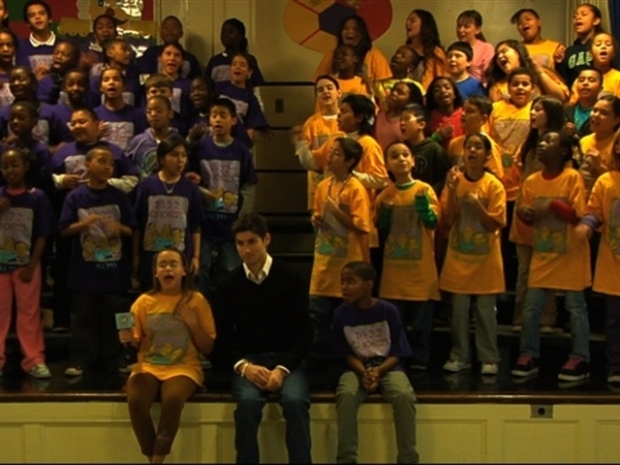 The talented kids in the PS 22 Chorus have gotten rave reviews for their renditions of popular songs like Lady Gaga's "Just Dance" and Coldplay's "Viva La Vida." Ben headed to Staten Island to see what all the (well-deserved) fuss is about. The "Love and Other Drugs" star is hosting the 83rd Academy Awards with actor James Franco. The Staten Island Chorus will fly to Hollywood to perform live for a nationwide audience on February 27th and at a red carpet pre-show. "It was emotional mayhem. It was wonderful. It was chaos, but the most wonderful kind you could imagine," chorus director Greg Brynburg told the New York Post. "They just barreled into me and hugged me... It was one of the most gratifying moments in my career." Hathaway, a Brooklynite by birth, is also a huge fan of the New York public school choir. "I've been watching the PS 22 choir on YouTube for about two years now and you guys brought such joy to my heart" Hathaway told the students. The famed school chorus boasts millions of YouTube page views and was honored as Artist of the Year at the annual Webby Awards this past summer.